Princess keeps its restaurant selections simple. Passengers on Ruby Princess have a few free and for-fee options to choose from -- including three main dining rooms, an extra-fee steakhouse and the venue from celebrity chef Ernesto Uchimura, giving them more options to splurge if they wish. Additionally, a select few Uchimura dishes are incorporated into the main dining room menu, allowing diners to sample some of the new offerings free of charge. Princess also does a great job accommodating dietary requests if notified ahead of the cruise. Even if you don't give the line advance notice, vegetarians will find appropriate options in nearly every dining venue, and low-salt items can be requested in the main dining room. Passengers with gluten and dairy intolerances, however, might be hard-pressed to find foods that meet their needs if they haven't given the ship a head's up. Michelangelo Dining Room (Deck 5, aft), Botticelli Dining Room (Deck 6, aft) and Da Vinci Dining Room (Deck 6, mid): Ruby Princess' three main dining rooms span two decks and feature similar design elements (muted color tones, wood paneling, twinkling-lit ceilings and floral-patterned carpet) as well as artwork inspired by the artists for which they're named. All are open for breakfast, lunch and dinner, though the Botticelli Dining Room is reserved for those who prefer traditional dinners (set dining times and assigned seating/tablemates). Seating times are at 5:30, 6:30 and 8:15 p.m. The Da Vinci Dining Room offers the earliest anytime dining options (open seating between 5:30 and 10 p.m.), while the Michelangelo Dining Room offers anytime dining between 6:15 and 10 p.m.
Dinner menus, which change nightly, are the same at each restaurant and include appetizers, "always available" dishes, soups and salads, signature pastas, main courses and a new "Crafted by Curtis" section, from which passengers can order complimentary, pre-selected meals designed by celebrity chef Curtis Stone. Popular starters include vegetable spring rolls and chilled soups (such as pina colada and apple cider), which are served in cocktail glasses and sipped from a straw. Entrees include "Princess favorite" fettuccine Alfredo, prime rib with corn on the cob and eggplant with basmati rice. Vegetarian options are available nightly. Desserts range from cheese platters to sugar-free coconut cake. You also will find an assortment of Norman Love-designed treats, such as a chocolate souffle. A small selection of "Crafted by Curtis" menu options is always the same, but varies based on itinerary. On our Mexican Riviera cruise, passengers could choose between dishes like mac-and-cheese and chicken with beets and goat cheese. Breakfast is available in all the dining rooms, from 7:30 to 9:30 a.m. daily. Options run the gamut from eggs Benedict to French toast with fresh fruit, and servers make the rounds with Norman Love chocolate pastries and tarts. Lunch also can be enjoyed in any of the three main dining rooms, from noon to 2 p.m., though only on sea days and select port days. Menu items range from mozzarella sticks and tuna salad to matzo ball soup and Lotus Spa dishes, which are lower in fat, sodium and cholesterol. Both breakfast and lunch are open seating. Horizon Court (Deck 15): The ship's buffet has a lot standout features. There's ample seating inside and outside so it's easy to find a table, the scrambled and fried eggs are actually delicious (which is almost unheard of in the world of cruise ship buffets) and waiters serve your drinks (iced tea, coffee, water, juice and lemonade) at the table. Prefer specialty coffee? Waiters will go out of their way to fetch you a mocha latte or cappuccino, if you're willing to pay. On the menu you'll find pre-fried eggs and made-to-order omelets, assorted meats, cereal, pastries (including Norman Love options), bagels, cold cuts, fresh fruit and oatmeal and grits for breakfast (6 to 11:30 a.m.). Early risers have a smaller selection of items from 5 to 6 a.m.
At lunch (11:30 a.m. to 3:30 p.m.), expect antipasti, grilled paninis, hot wings and soup. Light snacks, such as cheese and crackers, cookies and dried fruit, as well as iced tea and lemonade are served until 5:30 p.m. Dinner is served in Cafe Caribe buffet (details below). One thing we didn't love about the buffet? On busy days, we couldn't tell where the food line began or ended, and unknowingly found ourselves breaking one of the 10 commandments of cruise ship buffet etiquette: cutting in line. The wait staff tried their best to help by pointing us in the right direction, but it was every buffet diner for him or herself once in the ring. Cafe Caribe (Deck 15): Cafe Caribe is a smaller, secondary buffet within Horizon Court, offering mostly Caribbean cuisine but also other flavors from around the world. Because of its location, it's hard to distinguish from the main buffet; diners grabbing a bite at Horizon Court can end up at Cafe Caribe without even realizing it. 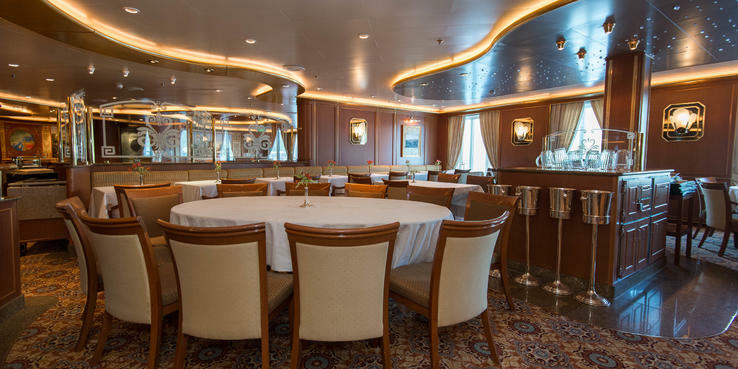 The hours are 6 to 10 a.m. for breakfast, 11:30 a.m. to 3:30 p.m. for lunch (on sea days only; port day hours depend on the ship's arrival time), 5:30 (when Horizon Court closes) to 11 p.m. for dinner and 11 p.m. to 4 a.m. for late-night bistro service. Breakfast options are pretty much the same as in Horizon Court, just a bit more limited. Lunch usually features themed stations, like Mexican, Italian and Japanese. Dinner features a carving station, deli sandwiches, sushi and themed nights, such as Italian or local fare. Passengers also can enjoy Caribbean-inspired cuisine like jerk chicken and paella-style prawns. The late-night bistro offers snacks and sandwiches. Wheelhouse Bar (Deck 7): Everyday from 11:30 a.m. to 2 p.m., the venue serves up a complimentary pub lunch (think shepherd's pie and fish and chips). International Cafe (Deck 5): Located in the atrium, the International Cafe is convenient and open 24 hours, serving complimentary pastries (including Norman Love options) and parfaits until 11 a.m. and free paninis and salads throughout the day. An adjacent stand sells specialty coffee and gelato. Specialty coffees -- such as espresso, cappuccino and flavored lattes -- and hot tea range from $1 (for regular coffee) to $3.50 (for specialty beverages). Slice Pizzeria (Deck 15): Located poolside is Slice Pizzeria, with both standard and more trendy options. Gluten-free versions of the thin-crust pizza are available upon request. Coffee & Cones (Deck 15): Get free soft serve vanilla and chocolate ice cream in a cup or cone; complimentary extras include sprinkles and whipped cream. You'll also find extra-fee specialty coffees and ice-cream sandwiches. Trident Grill (Deck 15): Open from 11 a.m. until usually 11 p.m., this poolside grill offers grab-and-go bites like hot dogs, grilled cheese and chicken breast sandwiches, burgers (including veggie) and fries. On most nights from 6 to 11 p.m., passengers also can enjoy smokehouse barbecue options. Room Service: Room service is free, and passengers can place orders 24/7. Breakfast must be ordered via a cabin card placed outside of your cabin door by 11 p.m. the night before. The complimentary menu includes sandwiches, salads and pastries. Canapes and pizza also are available for a $3 fee. Share (Deck 16); $29: With celebrity chef Curtis Stone at the helm, Share is Ruby Princess' most upscale specialty restaurant. The rustic, yet, chic vibe (contemporary farmhouse-style tables, eclectic wall art, wanderlust-inspired trinkets and industrial lighting) invites diners to dress in their best yet still feel relaxed. Open from 5:30 to 10 p.m., the restaurant -- which replaced the line's popular Sabatini's Italian restaurant during the 2015 refurbishment -- serves up inventive, high-quality meals that are meant for sharing (thus the name). The menu features a charcuterie platter and five courses from which diners can select one dish each: appetizers, mains, sides, cheese and desserts. We found the ingredients enticing. Dishes include shrimp salad with lemon gel, turnip, citrus salt and brioche; twice-cooked duck with fennel, bacon jus and parmesan crumb; and butter-poached lobster with caramelized endive. Share also offers an extensive wine list, ranging from a $9 glass of Austrian Gruner Veltliner (white) to a $480 bottle of South Australian Grange (red blend). Salty Dog Gastropub (Deck 7); $12: Every night from 6:30 p.m. to 10 p.m., the Wheelhouse Bar transforms into the Salty Dog Gastropub. Nothing about the venue actually changes, except that a dinner menu created by celebrity chef Ernesto Uchimura is available as is an extensive new whiskey menu. For $12 you get an appetizer for sharing (bread sticks with beer-cheddar fondue), your choice of three entrees (from a total of 12) and a dessert. The most sought-after dish is Uchimura's award-winning Ernesto Burger, which features inventive ingredients like caramelized kimchi, beer-battered jalapeno and charred onion aioli; the mere sight will make you salivate (we know from experience). Other entree choices include grilled cheese with white tomato soup; roasted cauliflower with curry; and Maryland-style crab cake topped with Old Bay seasoning. Some of the portions are larger than others, so come hungry or ask your waiter to clarify which dishes are bite-sized to help you decide what you can fit. Desserts include coffee and doughnuts, as well as our favorite: bourbon chocolate, salted caramel popcorn. Funny enough, we found the Salty Dog Gastropub to be more of a sharing venue than Share. And at five dishes for just $19, we think it's the best bang for your buck. Crown Grill (Deck 7); $29 and $14.50 for children ages 3 to 12: Crown Grill is Princess' signature steakhouse. Furnished with cozy booths, large tables, dark woods and dim lighting, it feels intimate -- perfect for date nights. The menu includes appetizers such as lamb carpaccio and pan-seared scallops; soups and salads; seafood dishes ranging from a mussel pot to Maine lobster; and a hearty list of chops and steaks. Popular entrees include a 22-ounce porterhouse and an 8-ounce filet mignon. One of our favorite treats at Crown Grill was the flavored salts served to complement grilled-to-order dishes. Diners choose between Hawaiian black salt, Himalayan Mountain pink salt and smoked applewood salt -- our favorite, which basically tastes like a campfire. Crab Shack (Deck 15); $29: On select nights throughout each cruise, from 6 to 9 p.m., the buffet hosts a pop-up-style eating experience known as the Crab Shack. Diners start off with popcorn shrimp, hushpuppies and clam chowder soup before they tie on bibs and indulge in entrees like bayou-style crawfish boil or a clam, mussel and shrimp pot. Reservations are recommended, as seating is limited to a small section of the Horizon Court. Crab Shack nights are listed in the Princess Patter, though we recommend snagging your reservation either the first or second night of your cruise. Chef's Table; $80 nonalcoholic, $95 with wine: Dining on Ruby Princess doesn't get much more exclusive than the 10-person Chef's Table. The experience begins with a tour of the galley, with cocktails and appetizers, ranging from foie gras terrine on toast to asparagus risotto with lobster. Dinner follows at a private table in one of the main dining rooms, where diners receive an exclusive handwritten menu. Each diner also receives a photo taken during the meal and an autographed copy of Princess' cookbook, "Courses, A Culinary Journey" as a keepsake. Reservations are required. Ultimate Balcony Dining; $45 for breakfast and $100 for dinner, per couple: For those craving a more intimate experience, Ruby Princess offers passengers the option to dine on their balconies with Ultimate Balcony Dining -- a meal served by two waiters. Available from 7 to 11 a.m., breakfast options include quiche, smoked salmon and fresh fruits, along with a half-bottle of chilled sparkling wine. Dinner options, offered from 6 to 10 p.m., include steak, lobster or both (surf and turf), preceded by Champagne and hors d'oeuvres. Vegetarian options are available upon request. Reservations are required and must be made onboard.